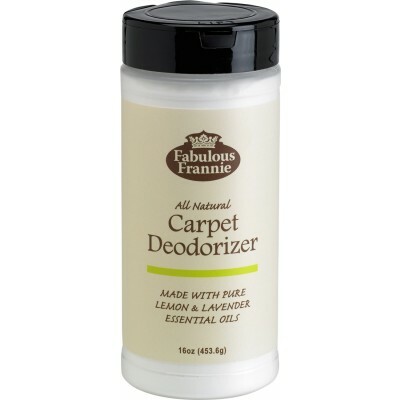 Fabulous Frannie Carpet Deodorizer combines 100% pure essential oils and natural cleaning agents to absorb bacteria and odors while providing an uplifting scent for your home. Cleaning has never been this safe and easy for you and your family! Vacuum carpet before application. Sprinkle Fabulous Frannie Carpet Deodorizer liberally over carpet or rug. Let sit for at least 1 hour before vacuuming thoroughly. Sodium Bicarbonate (Baking Soda), Citrus limon (Lemon Essential Oil) and Lavandula officinalis (Lavender Essential Oil).